The historic Central Library in downtown Los Angeles was originally designed in 1926 by Betram Goodhue and this landmark building is one of the largest libraries in the Western United States. 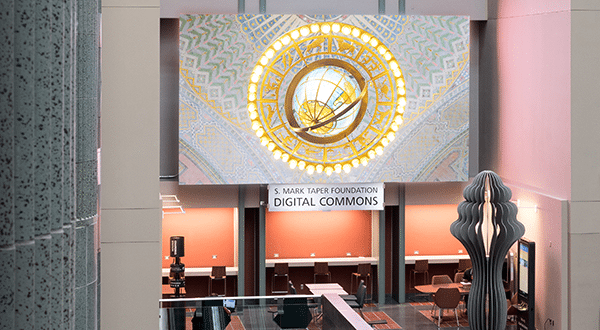 The LAPL recently completed the S. Mark Taper Foundation Digital Commons, a technology-rich social space for library patrons to work, collaborate and learn. The Digital Commons is a 1,000 square foot comfortable, yet modern space where patrons can connect digitally with the world. The highlight of the new space is a 28-foot wide Video Wall that is viewable from every floor of the Central Library’s Tom Bradley Wing. Norman Pfeiffer of Pfeiffer Partners designed the Digital Commons space and he was also the architect for the Central Library’s 1993 renovation and expansion. How is the Video Wall Telling the Library’s Stories? The Video Wall is intended to be a space for storytelling – about the Los Angeles community, the Public Library and our world. Content from the Video Wall is intended to delight, inform and educate library visitors with compelling visual stories and images that are enhanced when projected on a large scale. These captivating and mesmerizing videos on the 28-foot video wall are a highlight of the Tom Bradley Wing of the library, and are meant to be thought-provoking while making the library a destination visiting place. What Services Did Vantage Provide for the Project? Vantage was hired to support the Library team and Pfeiffer to integrate the video display wall system into the Digital Commons project. We started out collaborating with the team to create design options that reflect a positive vision for the Digital Commons space as well as providing a feature that draws and captivates visitors of all ages. We came up with three different design concepts – a “splat” screen which yields a fun and unstructured element, a wave wall that adds additional screens wrapping around the adjacent walls, and a traditional rectangular screen. You can view each of the design concepts in the slideshow below. Ultimately the Library selected the traditional rectangular screen, but left open the possibility of adding the “wow” factors from the other designs when additional funding is raised.